Abandoned coat,dry cleaned and returned to where it was originally found. An invite to visit the small village of Beesterzwaag in Friesland, a Northern Dutch province, resulted in my being being free to walk uninterrupted for a few days in the surrounding woods with just my trusty dog as companion. On the third day I was surprised to find a black jacket in what appeared to be very good condition lying on the ground a few feet from the path. It wasn't in need of repair but could certainly benefit from a clean. Wet coat in hand I decided to head back to the village to try and find a dry cleaners. Too small a place to have one I was led to drive to the neighbouring town, Drachten. There I found one and even though both myself and the friendly proprietor did not speak each other's language we somehow worked out that I could come back and pick it up the following Monday. 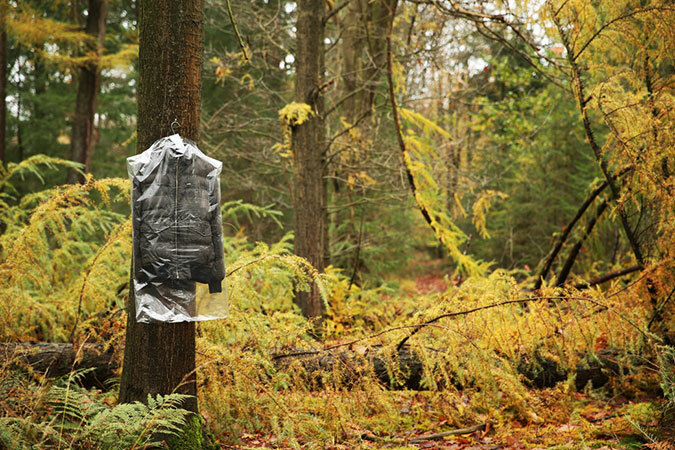 Three days later, with the cleaned jacket now carefully protected in one of those distinctive plastic sleeves, I returned to the original discovery site in the forest and left it there, hanging on a hook, ready and waiting for someone to collect it.